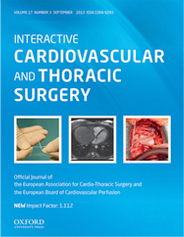 The primary aim of the European Journal of Cardio-Thoracic Surgery is to provide a medium for the publication of high-quality original scientific reports documenting progress in cardiac and thoracic surgery. The journal publishes reports of significant clinical and experimental advances related to surgery of the heart, the great vessels and the chest. 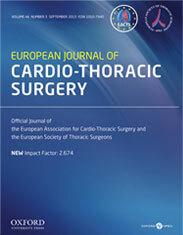 The European Journal of Cardio-Thoracic Surgery is an international journal and accepts submissions from all regions. The journal is supported by a number of leading European societies. Papers are submitted to peer review by members of the Editorial and Advisory Board and by other invited reviewers. Selected papers from the annual meetings of the European Association for Cardio-Thoracic Surgery and the European Society of Thoracic Surgeons are printed in the journal. Inline videos are welcome. ICVTS also invites readers to submit electronic comments on online papers before they are published in an issue. In order to move with the times the Interactive CardioVascular and Thoracic Surgery (ICVTS) journal will be online only from July 2018. The last printed issue was June 2018. 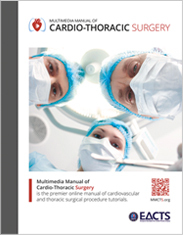 Multimedia Manual of Cardio-Thoracic Surgery is the premier online manual of cardiovascular and thoracic surgical procedures. Authored by experts in the field, MMCTS includes how-to descriptions along with informative videos and drawings to illustrate all the key points from the article. The EACTS journals app from Oxford University Press enables you to read the content from two leading journals, European Journal of Cardio-Thoracic Surgery (EJCTS) and Interactive CardioVascular and Thoracic Surgery (ICVTS), both online and offline on your iOS device. Automatically download issues and articles when you’re online, so that you can read them whether you’re connected to the Internet or not.